This is the 384 Sq. Ft. Simple Cottage from Sidekick Homes by Kephart Living. You can pick from two different styles for the exterior as you’ll see below. Either way, you get a covered front porch with space for patio furniture, additional seating, and a grill. When you go inside, you’ll notice a studio-like floor plan with an open living area, kitchen, and full bathroom. The design also features a 1-car garage with storage. “Simple” is a perfect description for this home. The combination living-dining room doubles as the bedroom by simply converting the fold-out couch into a bed, while the generous bath and kitchen are designed according to universal design principles– the same as all of our homes. An optional storage loft is offered, reached by a fold-down stair. An optional oversized one-car garage completes the package. You can share this 384 sq. ft. cottage design with your friends and family for free using the e-mail and social media re-share buttons below. Thanks. If you enjoyed this tiny cottage with a 1-car garage concept you’ll absolutely LOVE our Free Daily Tiny House Newsletter with even more! Thank you! Outside is cute, especially the top picture. Inside is functional. Anybody else think it’s time to find another term for a 12’x15′ space besides “Great Room?” No? Just me then. No place to hang clothes or, in fact, store any possessions except those things that belong in a garage, so this looks more like a vacation cottage than something for full time living. Not even sure where a small TV would go. However, really like the fact that there’s place for your car, and that it isn’t obvious or in-your-face there in the front – nicely tucked away and totally unnoticeable at back. So many homes make the garage the first thing you notice about the house – the ugliest part of the architecture. Talk about putting your worst foot forward. All homes should do what this one does. Overall, I think I’ve seen more functional layouts in a 384sf footprint, though, so I’m afraid this one doesn’t go in the file. Agreed, much more cottage than tiny house. By the way there is a large flat screen tv on the wall between the kitchen and bathroom. Ah, now I see the TV. Not so handy to watch from the bed, but at least there’s a spot for it. I like something like this but don’t see any closet space at all in the floor plan.. I wonder why? Very true. Need some kind of closet and storage. First, a little door inside towards the garage, between the couchs; besides, I can´t see the exact shape of the porch on the pictures as it is on the plan. And agree with Deadrock and Bundy about unexisting closet and storage space… Pretty, but it might be improved. 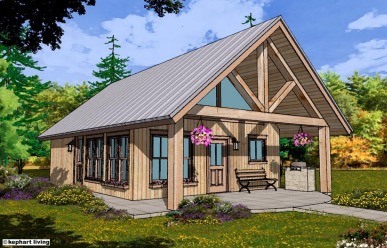 Can’t help it whenever I see one of the 16′ x 24′ plans I compare it to that cute little cottage by Brenda and Marvin that I adore https://tinyhousetalk.com/couple-build-384-sq-ft-tiny-country-cottage/ and everything else comes up lacking. I just can’t see sleeping on a fold out couch regularly and like everyone else I am wondering where would put your clothes and such. Thanks for the link NancyL, I LOVE that place, beautiful! I can’t find the kind of plans I need. It would be a square house divided into three sections. Down the middle I want entry&dining area/kitchen/laundry&utilities/bathroom. On either side I want a front living area and rear bedroom with bathroom entry, symmetrical. That way my husband can be watching his sports on his side and I can be painting and writing on my side. Then if he’s good, he can sleep in the bedroom on my side, or if he’s not, there’s that second bedroom!